When artist Georges-Pierre Seurat painted his famous A Sunday Afternoon on the Island of La Grande Jatte, he painstakingly added every dot of paint, one by one, until his masterpiece was complete. It was a technique that’s come to be known as pointillism, and thanks to this vibrating electronic pen, the process is now far less excruciating. 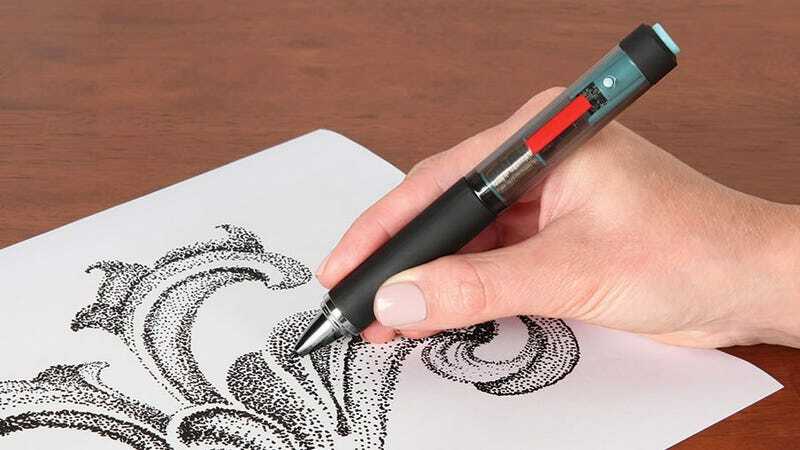 Similar to how a tattoo gun works, this Pointillist’s pen features an electromagnetic mechanism inside that causes the tip to vibrate and produce up to 600 dots per minute, which is roughly ten times the amount of stipples an artist can produce by hand. Is it cheating? Some pointillist purists might call it that. But who’s to say that if Seurat were alive today he wouldn’t have happily added this to his studio? Work smarter, not harder, can apply to the arts too. On a 20-minute charge the $70 pen can run for about 30 minutes, which is probably just about when you’d be ready for a break after having this vibrating in your hand for half-an-hour. You can presumably also swap in any color ink cartridge you’d prefer so your own masterpiece doesn’t end up being just black and white. Unless you work for the Walt Street Journal as a headshot sketch artist, in which case you’ll probably just stick with black.